Although we all know (and love) celebrating the 4th of July at the beach, with all the staples that come with it—the barbeques, the parades, the fireworks—there is so much more to a Maine Beaches vacation. For instance, our region is steeped in the history that ultimately led to the formation of our country. Whether you’re visiting over the holiday, or planning a trip later on this summer, we invite you to add a tour that discovers those deep roots and gives you a glimpse of our region through the lens of our past. Starting at the southern most tip of our region, Kittery Point is home to two key seaside military forts—McClary and Foster—now designated as historical sites and open to the public. Fort McClary, initially constructed in 1689 and officially established in 1808, was manned during five wars: The Revolutionary War, the War of 1812, the Civil War, the Spanish-American War, and WWI. The complex was expanded in the 1840’s to include several bunkers and a block house, all of which are still standing and accessible for the public to explore. Additionally, there’s a picnic area where binoculars are stationed along the seawall, allowing visitors views over the ocean all the way to the Isles of Shoals. Just a few miles down the road is Fort Foster, located on the southwest tip of Gerrish Island. Acquired by the Federal Government in 1872, it is home to several historical military structures, and with its sandy beach, soft tides, long pier, and views of Whaleback Lighthouse, it is an excellent place to plan your picnic lunch, family gathering, or for spending a day at the water’s edge. Travel just a smidge north to the Town of York and allow the Old York Historical Society to take you on a guided tour of the past. With family friendly exhibits, historical buildings, walking tours, and home to the Museums of Old York, visitors are immersed in the rich, maritime history of the town, from its founding in 1652 through today. York is also home to the Old York Gaol (jail) and McIntire Garrison House, both listed in the National Registry of Historic Places. Come a little bit inland to the community of South Berwick (nine miles from York), and you’ll be able to tour the Sarah Orne Jewett House, home to the famous author, and the Hamilton House, setting for her novel ‘The Tory Lover’. South Berwick is also home to the Counting House Museum, where you’ll find exhibitions and artifacts from the early 1600s through the mid-1800s including Native American, colonial, and early industrial tools and textiles. Also just off the coast (fifteen minutes from Wells) is the Sanford-Springvale Historical Society, a beautiful museum located in the refurbished old Town Hall building in Springvale. There is an extensive collection of artifacts and documents featuring Sanford’s history, including a huge assortment of antique carriage rugs manufactured at the mills, and over 1500 glass photo negatives featuring incredibly detailed images of the community’s history. A few years ago, the museum purchased and completely refurbished the neighboring Edward E. Goodwin House, which is remarkable for having virtually all of its original exterior and interior architectural details intact, and it has been furnished with authentic period furnishings (many of them from the original family) to show visitors how a household of the time would have looked. The house is on the National Register of Historic Places and it, along with the museum, is well worth a visit. 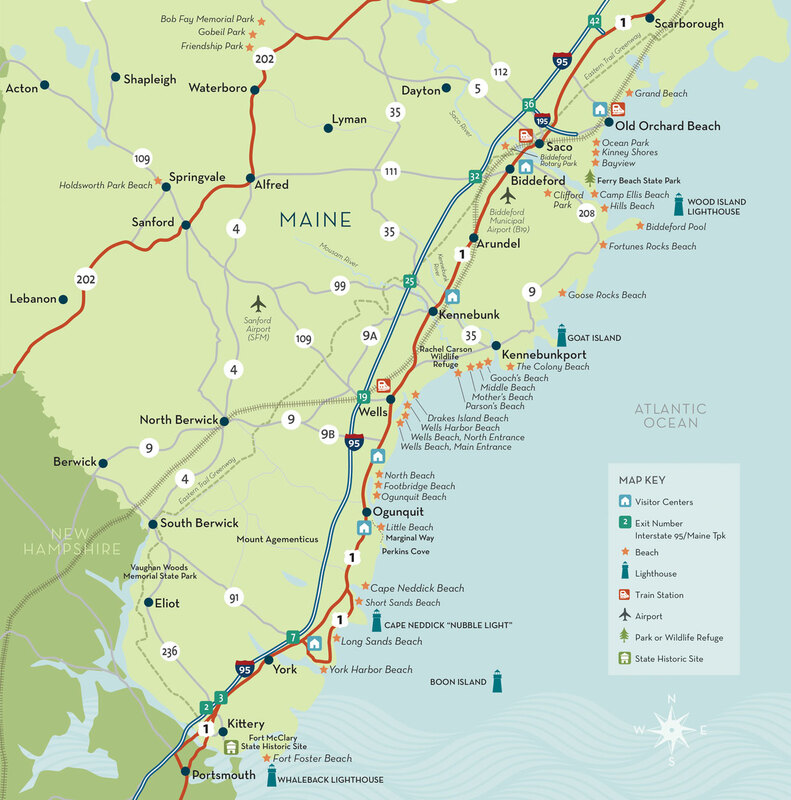 Head back to the coastline, and you can discover the historical beauty of Wells Reserve at Laudholm Farm, the Ogunquit Museum of American Art, the renowned Brick Store Museum in Kennebunk, or traverse the underground canals at the Biddeford Mills Museum. And in addition to regular offerings at the Harmon Museum in Old Orchard Beach, exhibits this year include one dedicated to the Big Band era, an unforgettable time in our country’s history! 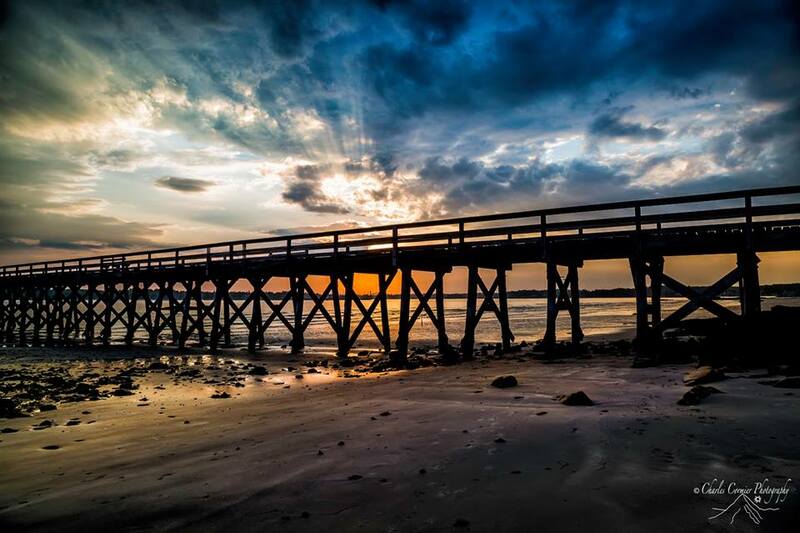 While this small sampling of local historical icons offers a well rounded view of the region’s past, Maine Beaches communities are also filled with centuries old architectural structures, cemeteries and burial places dating back to pre-colonial times, and events throughout the year. So the next (or the first!) time you visit the Maine Beaches, we hope you’ll build in some time to celebrate and honor the tapestry of experiences that make the region a place that is uniquely special—yesterday and today. ← MAINE BEACHES. SUN. SURF. SCRUMPTIOUS.